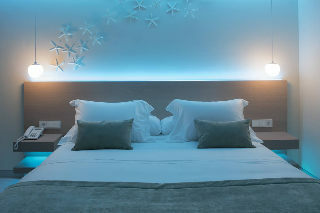 Comfort, elegance, design, art, pleasure and exclusivity, this hotel only for adults. It is to experience the best moments on the terrace chill out. Design, art, elegance and, of course, the most spectacular views of the Mediterranean Sea from the terrace both inside the room. Double Standard room has been designed to offer all the comfort in a perfectly proportioned space. It offers services and innovations to ensure a perfect stay. And how could it be otherwise, is present and is protagonist in our restaurant, both because of its proximity and closeness and the gastronomic offer, filled with authentic and delicious recipes based on fresh and natural products. In the Spa, you can enjoy the pleasure of water, care of massages, the well-being of body and mind.